An angle is formed by two rays that share the same endpoint. The point the rays share in common is called the vertex of the angle. The rays are called the sides of the angle. Angles are often measured in degrees. A circle is divided into 360 degrees. A straight line is half of that: 180 degrees. If you cut a straight line in half, you get a right angle: 90 degrees. Two angles that add up to 90 degrees are called complementary angles. They can be right next to each other, but they don't have to be. If they happen to be adjacent angles (right next to each other), they will form a right angle. As long as their measures add up to 90 degrees, they're complementary. You may have to solve some problems involving complementary numbers. Sometimes they'll give you the degree measure of one angle and ask you to find it's complement. Let's take a look at a few examples. We know that the two angles are complementary. This means that their angle measures add up to 90 degrees. We can use this information to set up an equation that we can solve for the missing angle measure. In this problem, we don't know either angle so it's not quite as simple as the first example. In math, when we don't know the value of something we usually assign it a variable and try to see if we can set up an equation. Let's call the smaller angle x. We know that the larger angle is 5 times as big. This means we can the larger angle is 5x. We know that the two angles are complementary, so we can add them together and set it equal to 90 degrees. 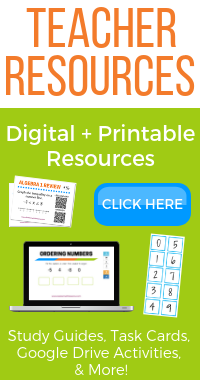 The hardest part with word problems is usually setting them up. Now that we have our equation, we just need to combine like terms and solve for x. 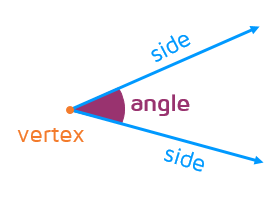 Remember, x represents the smaller angle. We need to make sure we answer the question and find BOTH angles. Two angles that add up to 180 degrees are called supplementary angles. They also can be right next to each other, but don't need to be. If they are right next to each other, they will form a straight line. As long as their angle measures add up to 180, they're called supplementary. 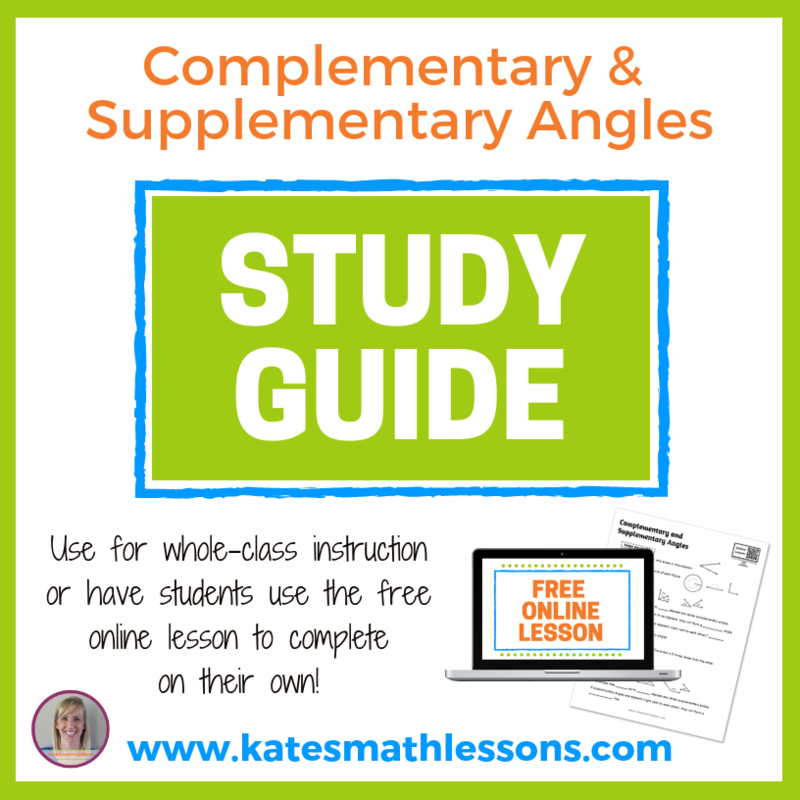 How do you remember the difference between complementary and supplementary angles? There are a few different tricks or sayings that teachers use to help students remember which is which. One way is to remember that C comes before S in the alphabet, so complementary angles are the smaller ones that add to 90 and supplementary are the larger ones that add to 180. Let's look at a few examples involving supplementary angles. We know that supplementary angles always add up to 180 degrees. This means we can set up and equation and solve it to find the missing angle. 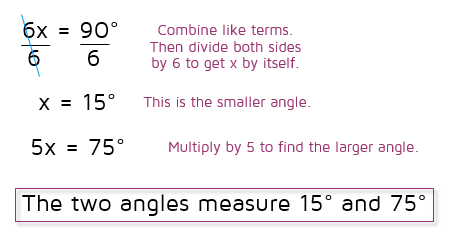 Here's another problem where we don't know either angle, so it's a little harder to set up. Let's say the smaller angle is x. How could we represent the larger angle? We know that it's 32 degrees larger than the small one. 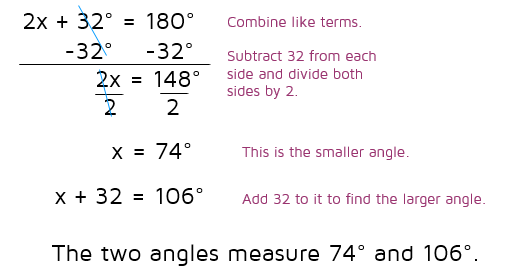 This means if we add 32 to x, we get the larger angle so we can use x + 32 to represent the larger angle. We know both angles add up to 180 degrees since they're supplementary, so we can use that information to set up an equation. Now that the equation is set up, we can combine like terms and solve for x.